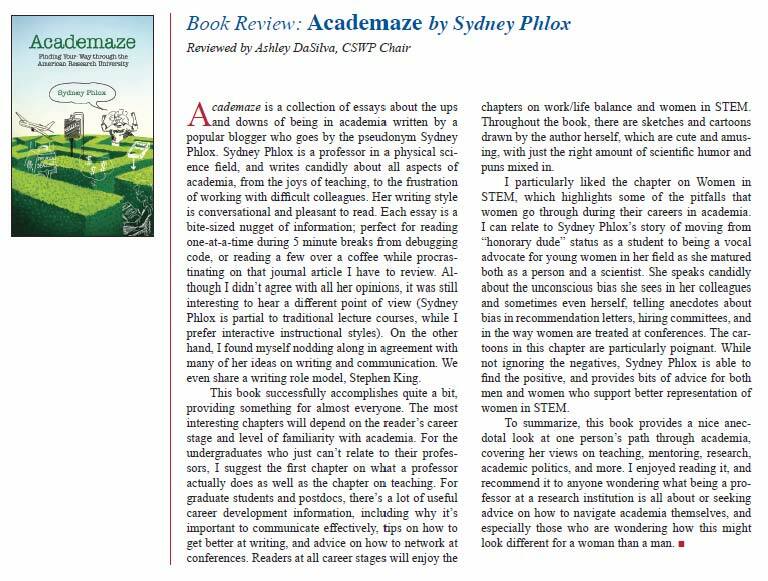 I just found a lovely review of Academaze in The Gazette, the newsletter of the Committee on the Status of Women in Physics (CSWP) & the Committee on Minorities of the American Physical Society, which was written by the CSWP Chair, Ashley DaSilva. Thank you for the kind words, Ashley! This review cheered me up tremendously. Here is a link to the whole issue, and below is just the review. Very nice review. Congrats! Makes me think that I should get my copy back from a friend and re-read a few parts. EarthSciProf: Totally with you. I went back to the book, too, which I didn’t think I would do anytime soon, and I reread the Women in STEM chapter! That was one powerful review.